The species is locally distributed in England with few records in Wales and Scotland. It is widespread in western and central Europe. Proximity to water seems to be a necessity for this species. Its natural habitat appears to be tree trunks adjacent to water, but it is usually found on fences and bridges and has been found under a pontoon floating some 30 - 50 mm off the water. Considerable numbers were found on a boat moored on the Chelmer and Blackwater Navigation in Essex (Ruffell 2000). Buildings near the water are also favoured but it is not often found on vegetation, although it is frequent on stiff vegetation in a garden adjacent to a disused gravel pit (I. Dawson, pers. comm.). Adults of both sexes have been recorded in summer and autumn, but females may be mature all year round. A female has been found in a torpid state under woodwork on a cold January morning. 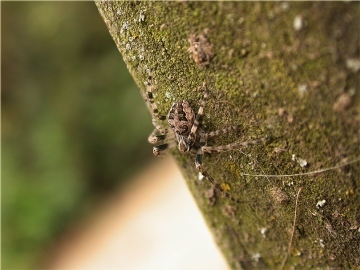 Very local, but the spider may be numerous where it occurs, e.g. Howes (1999), Ruffell (2000).